I must confess. Until recently I only made Chicken a la King with canned cream of mushroom soup. But then I discovered that you can make a delicious Chicken a La King recipe from scratch that is so easy that I will never go back to making it the other way again. In fact, we liked this chicken a la king recipe so much that I will probably make at least once a month, if not more. 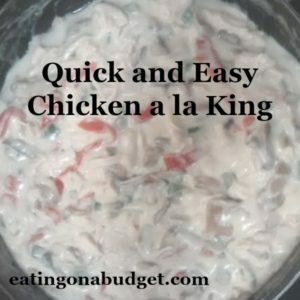 Chicken a la King is also very economical. You can use leftover chicken, or do what I did and just poach two large boneless skinless chicken breasts. And because this is so full of other delicious flavors and textures I could have easily stretched my budget even more and used just one large chicken breast for four servings. You can also use canned chicken but poaching chicken is really easy and very tasty. It is also cheaper than canned chicken. Just cook the chicken breasts in a small amount of water or broth and add a few herbs and seasonings (optional). Then, just let the chicken cool a few minutes before chopping or shredding. To poach chicken, bring water to a boil, add the boneless skinless chicken breasts and then let simmer, uncovered for 5 minutes. Cover, turn off the heat and let sit for another 15-20 minutes or until the chicken is cooked through. When finished, you have delicious, tender chicken for your favorite casseroles, chicken salad or just it eat as is. Here is a quick video that shows how easy it is to poach chicken. Back to this Chicken a la King recipe. I had all the ingredients on hand except for the pimientos so I had to buy those, but at just $1.29 for a jar I figured it was worth the splurge. You may be tempted to leave out the pimientos but they add such a unique flavor to the dish that I recommend including them (unless of course, you are not a fan). Other options are to add diced onion along with the green pepper, or maybe through in some frozen peas and carrots at the end but I like this simple recipe just as it is. We like Chicken a la King over biscuits but it is also good over rice, toast and even mashed potatoes. Next time I plan to double the batch for planned leftovers, serving it over biscuits the first night and over rice the next day. This recipe also calls for chicken broth. It’s always economical to make your own chicken broth but canned broth or chicken bouillon is fine as well. 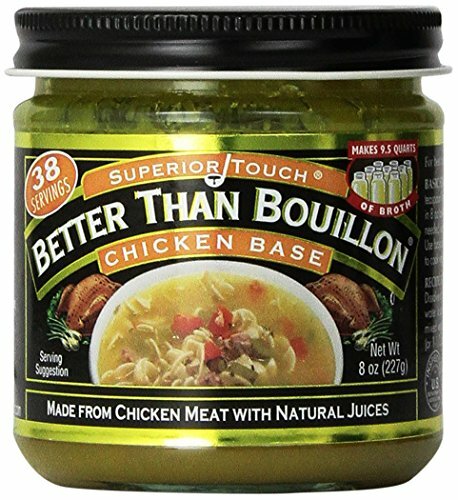 One staple that I always keep on hand is Superior Touch Better than Bouillon chicken base. You just add one teaspoon per cup of boiling water and it makes a rich and tasty chicken stock. 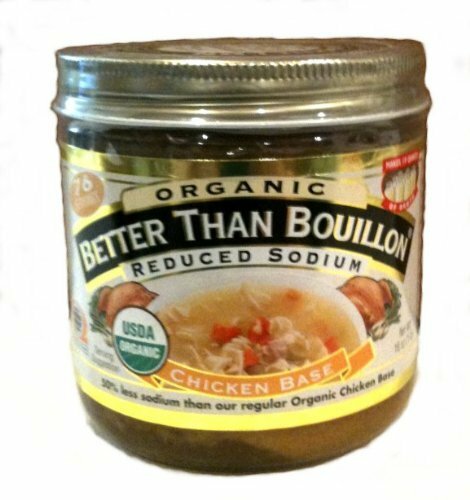 It costs more than bouillon cubes but is more economical than canned or boxed broth, and in my opinion, tastes just as good if not better. It’s more of a concentrated chicken stock consistency that you refrigerate after opening. The 8 ounce jar makes 38 cups and it comes in a 16 ounce jar as well. It is available in several flavors such as chicken, ham, beef, vegetable, mushroom, etc. Reduced sodium and organic are also available. It is available on Amazon but you might be able to find it locally. In a large skillet, melt the butter over medium-high heat (don’t let the butter burn). Add the green pepper and saute about 5 minutes, or until crisp-tender. Add the flour, salt and pepper and cook, stirring constantly for about a minute or until bubbly. Remove from heat. Slowly whisk in the chicken broth and milk. Return to stove and cook over medium heat, stirring constantly until it start to bubble and thicken. Reduce heat, stir one minute. Add the cooked chicken, mushrooms and pimientos. 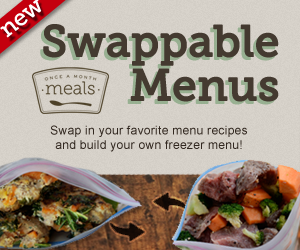 Serve over rice, biscuits, toast or mashed potatoes. Tips: I use a large can of mushrooms because we like a lot of mushrooms but you can use a smaller can if preferred. I buy the canned mushroom stems and pieces because they are cheaper than canned sliced mushrooms. You can also use fresh sliced mushrooms as well but instead of adding at the end, saute along with the peppers until softened.